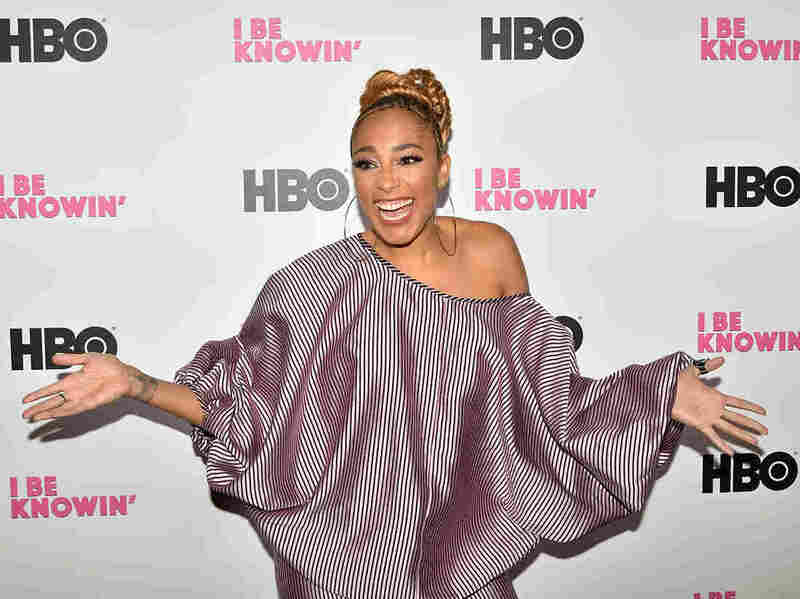 Comedian Amanda Seales attends HBO's "I Be Knowin'" screening at The Roxy Hotel Cinema on Jan. 23, 2019 in New York City. Actress and comedian Amanda Seales is the type of modern renaissance woman who it seems has always been around to entertain us. Before her star turn as Tiffany in the HBO series "Insecure," she was the MTV2 host known as Amanda Diva. She briefly toured with the neo-soul group Floetry, and she has been making appearances on college campuses for years with her comedy show Smart Funny & Black. She hosts a podcast, "Small Doses," and she's earned legions of fans on Instagram and Twitter with hot takes on everything from dating to modern race relations. But it's her stand-up special on HBO, "I be Knowin'," which premiered on Saturday, that makes Seales feel like she's truly arrived. "It's absolutely a milestone," Seales told NPR's Michel Martin. "I'm having a private screening event that is essentially my wedding reception. We literally have a wedding cake with a topper." With her new special, Seales hopes to cement her position as a trusted and thoughtful comedic voice that speaks to a demographic that she says has long been ignored: black women. "Everybody except for racists, rapists, sexists, misogynists, narcissists, or those that are calling the cops on black folks just living our lives ... It's not for Trump voters or people who don't believe that white men can be terrorists. It's not for bullies, not for abusers and not for people who keep asking me, 'Amanda can I pick your brain?' No! It's not for people who don't take care of their kids or people who take their shoes and socks off on planes — who raised you?!" All jokes aside, Seales is clear about her target audience. "I wrote this and I perform this specifically to connect with black women," she says. "Anybody else who enjoys it, I mean, feel free. But I wanted to give us something to add to our own canon of representation." Seales' comedy centers on interactions that are specific to black women with the acuity of a storyteller, including everyday mundane slights in the workplace. "When you are a black person in any office, you stay ready, because you're always wondering, 'How black am I going have to get?' And what that really means is you are going through a series of checkpoints on how you are going to check somebody on a scale of Stacey Dash to Nat Turner," she riffs. She says the raucous laughter from her audiences is a sign these topics have been neglected. "It's never addressed," she says. "Black women are in the workforce toiling and managing so many methods of racism, sexism ... elite-ism, all the 'isms' just to continue to aspire to excellence. And it just doesn't get talked about." "I Be Knowin'" covers a lot of ground in an hour — like the expertise black women have at giving compliments, street harassment and the mental negotiations involved in making the decision to go out or stay home. For her hilarious bits reimagining the day-to-day lives of prominent figures in black history — like Harriet Tubman — Seales relies on her master's degree in African-American studies from Columbia University for source material. "I reference a lot of history as a tool to discuss the present and to conceptualize a better future. There's a reason why I do a whole Harriet Tubman bit ... I think we've been learning about Harriet Tubman for so long as this picture on a wall, but she was a human. She was a person. She had to deal with customer service issues when helping to bring slaves to freedom." And as a comedian who works on college campuses, Seales agrees with some comics who say the environment has become too restrictive. "I think the reality is that college campuses have a different vibe than we had when I was in college. Professors have to provide trigger warnings and there's just a different conversation that's happening on these campuses around ... conversation," she says. She points to the example of a trans person at one of her shows who was offended by one of her jokes. "They were offended by me saying trans and not referring to trans people, and it was clear that my intent was not to offend and not to demean. At that point, as a comedian, you're just like, 'Well I can't account for the things that are going to offend everybody.' Once you start adjusting to every individual, you're killing yourself." Seales says her next step is to take her comedy show on tour. She says that after a lifetime of entertaining, "I Be Knowin'" has emerged as a jumping off point for future endeavors. "It's really exciting to see this milestone turn into more milestones."